• Grill marks can be difficult to achieve. Yoshi Grill and Bake mats are not a comprehensive grilling solution, with the cooking of meat being its weak point. It does, however work quite well with fish or vegetables. Despite a few cons, Yoshi Grill and Bake Mats will probably be a welcomed by most grilling aficionados. Yoshi Grill and Bake Mats are advertised as a way to improve the grilling process by providing a clean nonstick cooking surface that helps cook food more evenly than traditional grilling. If you purchase from the official website, you can expect to pay $19.99 for 2 grill mats and 1 bake mat. A bonus spatula is also included. 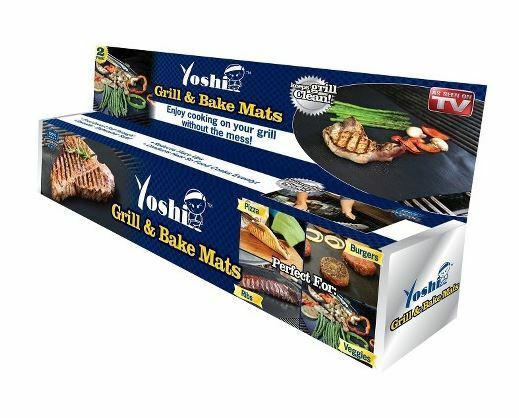 You can find the Yoshi Grill and Bake Mats at retailers in the As Seen on TV section for about $10. The TV commercial below was first posted in April 2014 has been airing as of this writing, June 2015. Although grilling is a tradition embraced by many, for some it can be a frustrating process. Flareups, food falling through the cracks, and uneven cooking can all contribute to a less than optimal grilling experience. The Yoshi Grill and Bake Mats are said to alleviate those problems and more. The product provides consumers with a 2-sided non-stick cooking surface which can be placed right on the grill. Food is then prepared on the mat, which supposedly cooks it more evenly. On the plus side, Yoshi Grill and Bake Mats do provide an excellent non-stick surface, and provide a great way to keep food from falling through the grill grates. In the case of vegetables and fish, it performs as expected. It is also nice to have on hand when using a public grill at the park or campground. We discovered three “cons” associated with the product, which have been largely echoed by other reviewers. First, achieving grill marks is quite difficult as the mat cannot be placed over an open flame. Second, juices from various foods tend to mix and pool together, which is not a desired effect. Finally, the mat is on the small side at 13 x 15. Users on Amazon give it a somewhat positive 3.5 star rating, which is right about where we feel the rating belongs. Perhaps the most high-profile competitor to Yoshi Grill and Bake Mats would be Miracle Grill Mat, which has also been advertised on television recently. It performs similarly, and is slightly larger. In 2016, a follow-up product was released called Yoshi Copper Grill Mat, which you can see in the review below. Yoshi Grill and Bake mats are not a comprehensive grilling solution, with the cooking of meat being its weak point. It does, however work quite well with fish or vegetables. The product can be found at retailers in the As Seen on TV section, and this is the best way to obtain the product in order to avoid shipping delays. If you’ve used Yoshi Grill Mat, please give it a star rating and comment below. Miracle Grill Mat Reviews: How Well Does it Work?